Who is waiting for Apple TV? The new $99 Apple TV, announced on Sept 01, had always listed on Apple Store with a shipping date in September. Apple yesterday started charging for those who pre-order the Apple TV. But some customers also received email from Apple informing that their expedite shipping charge is waived due to a possible delay. And on Apple Store, Apple TV is now listed with expected ship date in 2-3 weeks. There is no words from Apple on what’s happening. It could be a product delay, another possibility is Apple TV is selling so well that Apple is running out of initial stock. The next generation AppleTV will sports an A4 CPU, flash storage, full 1080p HD capable, work with cloud-base storage or Time Capsule storage, iPhone OS, and $99 price tag. This is clearly a strike back at Google TV if the rumor is true. 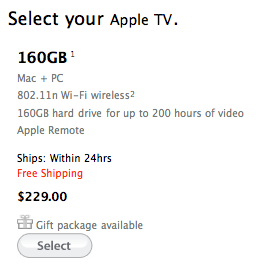 And with that price, the new AppleTV will be selling like hotcakes for sure. Cheaper, smaller, HD capable and with a focus on cloud content, Apple is putting AppleTV back into the game.